These are some of the products produced by our trainers. 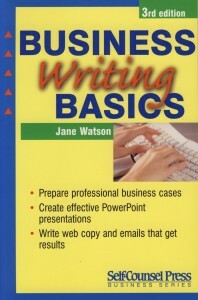 Just as the field of business writing has expanded, so too has the third edition of Business Writing Basics. As in the previous editions, this book is designed to teach people to use a business – not an academic – style of writing, to create documents and to respond to email more efficiently. It contains more than 200 useful tips, samples, worksheets and checklists. Contact Us to buy this book. Minute takers perform a vital function at meetings. Without effective minutes, many of the ideas and decisions made at meetings would be lost. This revised edition of The Minute Taker’s Handbook is designed to help all people who are involved in the minute-taking process, either on an occasional or regular basis. Along with helping you to become a confident minute taker, it provides techniques and examples to enable you to produce concise, accurate minutes for all types of meetings. If your job involves taking minutes, this book is a must-read.